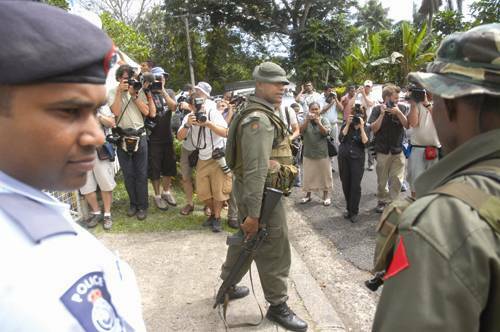 THUG AT WORK: Savenaca Siwatibau Rabuka (middle) at the Qarase blocade in 2006. Naliva at front left. 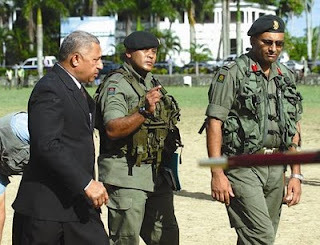 Coupfourpointfive today reveals a list of military soldiers and police identified by Fiji citizens as those who've taken part in beatings at the Queen Elizabeth Barracks. Ben Penioni Naliva has been the focus on this occasion but others from RFMF and the police have had a hand (either as ringleaders or bum boys) in the illegal acts of violence in recent years. Savenaca Siwatibau Rabuka is one and Captain Aseri Rokoura, who was identified in the beating of trade unionist Felix Anthony, another. And thanks to the help of reliable sources, the following have also been identified as QEB Goons or the underwear intelligence masipolos as one reader has dubbed them. Where possible we have included the addresses and phone numbers. As said, the people behind the ugly practice of punishing and brutalizing citizens who disagree with Frank Bainimarama, should not be protected. 1) EPARAMA BULEWA. Father's name Timoci Bulewa, 50 years old, resides at Lot 11 Cevuga Road, Kalabu Housing. Home 7566 2326. Member of RFMF for 29 years. 2) SAVENACA SIWATIBAU RABUKA. 31 years old. Resides at Lot 4 Lady Davila Road, Davuilevu Housing. Phone 3385 222 extension 1490 work. home 363 1158. Army Officer. 3) MIKAELE WONG, 31 years old. Block 5 Flat 7 Grantham Road, Raiwai. Phone 3385 222 work. Home 7289 129. Army Officer. 4) DETECTIVE SERGEANT 196 APIMELEKI DIGITAKI. Father's name Taniela Mavi, 42 years old. Tomanu Road, Nadera. Police Officer. 5) KALUSI V SERU. Father's name Akariva Seru, 39 years old. Residence Raiwaqa Police compound. Phone 3310 721 (work). Police Officer. 6) VILIAME SAUMAISUE. Police officer. Private Dusi, Private Lee, and one Epeli - lay preacher at Wainivula Methodist Church and soldier by profession. Confirmation of their details to be provided. Civilian informer: ATONIO TANABURENISAU, 60 years of age, resides Tacirua Village, Nasinu. Phone 7566 2361 (home). MACIU VULAONO of 3FIR. The younger brother of Teleni/Atu Vulaono. Ringleader of Roko Ului's hit squad and involved in some of the tortures last year and the beating of SDL members in February 2010. A petition has also been launched to urge the United Nations to stop offending soldiers from peacekeeping duties. See link below. Editor's Note: Vinaka Vaka Levu to the reader who started the list. these guys have to be ready some one will bomb thier houses soon. And those who hide in the shadows, shall truly be exposed for all to see ! thnks coup4.5!! Keep releasing more of the civilian informants? lets shame these damn Liumuri's n ratbags!! given that the regime is thanking its luck stars that the old senile former illegal president is dead and can't possibly name names in any future court case we can work from the ground up , when they are all rounded up they will turn easily on each other to save themselves. Who gave the orders, who gave them orders etc. all the way to the top. Then we can at the very least bankrupt the bastrads with court cases that will go on for a decade.At best we send them all of too their own gaols. Torturing is Illegal under Fiji Law and illegal under UN law. and also investigated by the UN. The UN must immediately cease the employment of Fiji soldiers. Great job C4.5! I was just waiting for this. You should find their pics especially with their wives & children. Find out where their children go to school etc. Ooooooooouuuuuuu, this is so so exciting...coz now we get to know who they are and they don't know who we are! Yipeeeeee, time to get to work. I think Naitasiri chief should send message to Atonio to leave Tacirua Village. Give him and his family 24 hours to vacate the village. To you guys in the list, better watchout, don't question anyone when something happens to you. To C4.5 - What do you plan to achieve by publishing these soldiers residential addresses? Are you trying in instigate violence against these men and their families? Isn't that as bad as what they are accused of doing right now? Is that how you fight for democracy? Will you be held responsible for any harm that comes to their wives and children as a result? What's to say some of the names on your list are wrong and have been passed on to you by a faceless informants who actually have personal vendettas against these men? Dogs. Time these military cowards got a taste of their own medicine. They are a disgrace to the nation and have brought shame on their own families - their children and grandchildren will have to live with this for a long long time. Is Captain Aseri from Nabua ? Thank you C4.5 Editor, please keep publishing full relevant information names and addresses of those cruel soldier's policemen who love torturing people at the QEB under the spells of FB, AK and Tikoitonga. What happens to their families after that will be their own problems to take care. Publishing names and addresses like this is certainly the best temporary solution to stop those cruel soldiers' cruelties apart from UNDHR full investigation and actions. We are coming home for them now. We, the iTaukei are beautifully and wonderfully related to one another by Yavusa, Mataqali, Tokatoka, Vanuas and Lotu. We are very close joyful and happy iTaukei family. Since these few cruel soldiers have forgetten our iTaukei cultures,customs and traditional relationships and values, we have no option but to take them openly to where it hurts most. Eye for an eye and tooth for a tooth. What these cruel soldiers/policemen have also forgotten that neither their parents, Lotu and Vanuas ever taught them to be cruel with full of hate but, rerevaka na Kalou ka Doka Na Tui/Vanua. What I feared most that one day soon arms smuggling to Fiji will come to fight soldiers, which later on will be used like Mafia gangsters. All started with the few bad cruel soldiers and policemen at the QEB today, encouraged by evil soldiers. To you GOOD Soldier boys, please make your pious move and cross the border when the right time comes and help to make better Fiji under the usal leadership of the Lotu and the Vanua, of Which and Where our Lotu Vanua and Ratu's works together that made Fijian historically famous in World War 1 and 2. Malayan campaign, Rugby and peacekeeping. Today, we are shattered Fijian race or iTaukei family, created by those few cruel soldiers and policemen under the spell of FB, AK, Tikoitonga. All in the name of GREED. KEEP PUBLISHING THESE BASTARDS NAMES AND ADDRESSES EVERY DAY COUP 4.5 EDITOR SO TO PYSCHE THE BOYS TO BRING AN END TO THESE CRUELTIES IN QEB BY THE FEW BAD SOLDIERS AND POLICEMEN, PLEASE. To you the writer that published at 7.40 pm March 15th above, please try and understand the pains that I am suffering today with members of my family you killed and some you totured at the QEB. They were innocent and nowhere near to the incedents at QEB but you forced them and us with pains that never end. Your problems that you continuing toturing men and women at QEB since 2006 until today under the barrel of guns with Franks and Kaiyum's orders and personalizing things. Those young inexperienced newly promoted Majors and Lt Colonels lately filled Driti and Ului's vaccum will soon go wrong all the way. PEOPLE'S POWER is increasing day by day and soon explode like Egypt, Tunisia, Baharain, Libya. Yemen, Somalia, Tonga etc. Lately, some Ratus or Tuis have switched sides with Frank because of monies and we already knew it too. Na Turaga dina ni Vanua e sega ni liumuritaka se volitaka na nona tamata kei na Vanua. We also knew that Frank and your bad soldiers are moving in to corrupt the Talatalas too. Hey you! we are not blind nor ulukau like you. Walls have ears soldier boys. You know the drill?. My nieces and nephews are crying and suffering now because you killed their fathers at QEB and there is no future for them left in school and work nor able to pay for panadols to ease their headaches. Those informants were not faceless because you once uselessly used them for your own and your family agendas and now they knew the truth where the power is and will be useful to the iTaukei ni Vanuas and Lotus. C4.5. go ahead give us more information and publish names and addresses to stop all these arseholes from toturing people at the QEB. That's it go ahead. Perpetuate this culture of violence. Instead of fighting for justice you choose to lower yourself to propaganda hate speech. When Fiji descends to violent civil war, and wives and children start being introduced to the violence, I hope you take responsibility as frank will take his. Am just watching this and shaking my head at the stupidity of it all. @Anonymous 7:40, So what do you suggest is the best way of stopping the torture and murder of innocent Fijian civilians. The Police turn a blind eye. The Judiciary don't care. They let Rabaka's murderers go free. So who will bring us Justice? So unless you have a good suggestion,don't waste our time. I say "good on you C4.5" because no one else will expose these bastards. I have come across many cases in my neighbourhood where wives and children of soldiers are actually taking advantage of the new found status of their military father,and actually support what they do. E.g. During a game of touch, one of the boys fought with someone whose father is in the army. Next thing, a military van arrived at their, where he was taken up to the camp and by the time he came back, never spoke to anyone for almost a week, so traumatised. There are many cases which are not brought to public attention where military children would threaten to report to their fathers if others did something to them. So yes, publish the names, and we urge anyone who has been taken up to camp to expose their abusers.It is time to bring down this thuggery military by abusing their position to trample on others. Every dog has his day, that's the beauty of it! This vindicates Australia and NZ stance in banning the goons and their family from entering their country. They should ban them for life until justice is brought upon them. Good on you Aust & NZ. Apply further bans on these goons please. Amon at 7.40pm and 10.55pm resonate as the same person. If Fiji was free of the illegal regime the sentiments would be applaudable. It's not. The military and the police are big enuff and ugly enuff to look after themselves. It's time we looked after the people, don't you think? Well I am not one to quote the bible however after reading some of the mirthful comments I thought it would befitting to share with you hypocrites this passages of the bible. We have resorted to devouring our own people it is true today as it was then you can take people out of their cannibalistic ways of life but you cannot remove the cannibalism from within. We know what these guys did was inhumane and egregious but are any better? Now I can build a house at 30% less than the price my neighbour did in 2005 when he withdraw his funds from FNPF. No I can leave the other 30% in the FNPF for future use. Qarase couldn't bring this hardware price cause he was in the thick of things. He eascaped jail while his guy and MrBhika probably will. Coup 4.5 The world is in crisis. Japan is in the fore. New Zealand is more concerned about its economy than Fiji. Shares are in free fall. The international community is now worried about Nuclear fall out. Where does an international move against fiji stand - in the back burner if at all! Who were the Soldiers that walked into the parliament and told Ministers to leave that building, where do they live, who are their relatives ? What are their numbers and addresses etc. where are they now, what positions do they hold for this act of high treason ? Does anyone know just who is getting paid what amount and how much is being paid under the table through envelopes, unaccountable to the people ? Toso Viti Toso! We are getting there! Keep putting their names up C4.5! You're doing a great job. Now the Hit Squad will re-think what to do when orders are given to beat someone up! Hey you,7.40pm and 10.55pm resonate, Do you ever realize how painful the pain is itself when you excessively or unjustly and unfairly inflicted upon men and women at QEB Killing Field? We know that you are one the hit squad senior army officer acting as moderator or speaking like Talatala, Pastor,or Reverend in this C4.5 column. What I am refering to is the Killing Field inside QEB run by you and your team. Listen Turaganivalu man, your team numbers are very small and very few (50 members) that brought unbearable shameful to the most highly respectable institution of Fiji, the Royal Fiji Military Forces, which was established by our fathers and grandfathers for the defence of the Vanuas/ Chiefs, children and Lotu in World War 1 and 2. CWMHospital was built from their sacrificed salaries, which their respective families should have enjoyed but they were also denied of a fair and just living at that point in time. Na dokadoka e tiko oqori vei iko & team sa rui sivia na kena iyalayala ni nomudou viavialevu. What rights do you have to murder and excessively torture men and women at the QEB Killing Field? You ask me the same question, What rights do I have to torture and hurt your innocent wife and children or burn your home down to ashes. How do you feel when you return home one day and see the blood all over your wife and children's clothing and crying in pain to you for help and you were nowhere near to stop us. All because of your dirty, murderous and torturing tactics that made your family suffers. I beg you to STOP STOP STOP RIGHT NOW before it is too late. Remember, you left me with this painful life and unforgetable stigma today since 2000 along with my nieces and nephews. You started all these VEIVAKALOLOMATAKI KEI NA LABA my friend. You talk about justice and civil war. There will be NO CIVIL WAR amongst 800,000 people in Fiji but only with you and you 50 cruel, murderous and torturous Tikoitoga, Bainimarama and Kaiyum's hit squad. Now we know who you are and better be on your guard for we are coming to get you and your families. To you the Kai Idia not Fijian, please keep away but support the People's Power and not the army hit squad of 50 with FB, AK and Tikoitoga. Editor C4.5 give us the names and addresses. Vinaka vakalevu because this murderous must be stopped now. why not stand up people, claim your freedom. As an experience in our community gathering, we had to be very careful what we said in front of military wives and/or children for fear of being reported, as some also pose as informers. A few fights occured as they tried to justify what the military is doing, so the brainwashing is not only on the husbands but the entire families had to be party and supportive of the coup. Dear Editor, thank you for publishing these names. It is time to expose the real culprits. They can run but they can't hide. Let's see if they can play the game - bring it on. The time has come to start levelling the playing field.-C4.5 to Anon. Look forward to hearing from you. When you can , please make your list more effective!....in the traditional sense. Publish their village, vanua, yavusa, mataqali etc. I have noticed in a lot of the comments that the UN is mentioned as the big brother who will eventually come and investigate the abuses in this country and punish those who are found guilty. .In my humble opinion the UN is a tooth less, ball less, gutless and Lamusona organization. A recent example would be the Libyan scenario. The pen pushing tie tooting tea drinking numskulls reps to the UN are still debating whether to instill a no fly zone over Libya while the m....f.... Gadafi is killing thousands daily. People who just want freedom from this monster are being wiped out. What good is a commission of inquiry when families are destroyed and thousands are dead? The world needs a rapid reaction force made up of soldiers from all democratic countries to simply go out and kill al dictators. Do it once twice and no body will think of taking over a country by force again. The problem with this world is that we talk too much and do too little. Our society rights more reports and discusses issues until the cows come home but nothing gets done. Sometimes the threat of extreme violence is necessary because men like Gadafi and all his dictator pals only understand this language. They are like common school yard bullies once you stand up to them that is it. This force should be heavily armed and funded by the UN. Over time the UN would not be needing so much money as their will be no more refugees to feed and peace keeping duties to fund. People like Gadafi know the weakness of the UN and they exploit it to the max. The UN in its current form is a lazy and fat organization with a lot of resolutions and nothing else. Now that we are more advance than these bastards at QEB KILLING FIELD. We have been waiting for this informations long enough to see the real culprits sucking and enjoying Baini's boci. Thank you so much Mr Editor for your job well done in resurfacing these magaijinadra's names for the world to see. Totally agree with Anon 2:11PM - UN is useless and we should not hold our breath on them doing anything. If they can't step in when thousands are dying in Libya, don't think they'll be thinking too much about a few people in Fiji. If anything has to be done, it has to be done by the people with the backing of loyal soldiers who haven't been bought off by Baini and still have loyalty to the country. Funny how people like Jake and others who shake their heard can see that violence is wrong when citizens have been empowered with information about who their oppressors are. And have the chance to right the wrongs. But while the judiciary, the police and leaders have forsaken citizens and military has mistreated people, the Jekes of the world have managed to find plausible reasons. A case of the jandal being on the other foot and Bainimarama foot soldiers not liking it? Is he married to a Naomi? You are a sarcastic hypocrite! The times are a changing and JUSTICE shall be meted out to those who enjoy cruelty, torture, murder without even flinching. You dear Jake, will be given the best VIP seat available to witness these happenings. There is nothing you can do to prevent it. When you talk of Scripture, remember, God sees all that takes place. Even those (like your pitiful self) who praise the evil that wicked men do. This is not about casting the first stone or pulling out the speck. And quoting the Bible makes you a blasphemous - do not take bible verses lightly if you do not respect the Bible or its author. This is about JUSTICE! All the lives lost, blood spilled, pain and anguish caused, for all people who have suffered, the perpetrators will have to face the consequences one day. let's do a "driti" and send their names to the UNDPKO to be struck off and banned from UN operations. Of course the only way Vore will keep them happy is by sending them overseas every now and then. Once that stops, there's nothing left for the troops. Do you guys remember the Soldiers who were forced to disembark from a plane in Nadi because an International organisation had threatened to have them arrested at the other end ? I think it had something to do with the murder of that young man by the 8 Soldiers who were out of jail in a matter of months. That organsiation should be approached again and all these names given to it for consideration as well as a request to stop peace keeping deployments and to send home all Fiji Police, Guards and Soldiers because of the terrorising of their own Citizens. Siwa Rabuka is the son of a lawyer, Epeli Rabuka, cousin-brother of 1987 coup leader, Sitiveni, who himself had a goon squad, who tortured that USP Lecturer that Government had to pay compensation of $739,000 in 2007 (finally after judges passed that hot file around for 20 years). Siwa's been fingered by quite a few of those tortured and abducted since the December 2006 coup. Is he on UN peacekeeping duties? Baini Marama and his criminals will get justice one day, it's not a matter of if but when. Fiji has suffered tremendously because of Marama Baini. People of Fiji, rise and get rid of this monster. Exile all these arseholes to Nukulau and let them fend for themselves. Please never forget the chief henchman Ului Mara the luveni manipusi. He terrorised so many innocent people now hes hiding in a mongoose hole. We'll dig him out and give him a taste of his own medicine. Sapalaki mada! Don't forget the dyed in the wool supporters of the regime like Jake Tulele, the ex-British Army toilet cleaner and bankrupt sidewalk fish n chips pusher at the Union Club. Yes the Jake that shits out all the b/s we read on the blog. Him. Last time I checked his phone was Jake Tulele 3606119. Lets pay him a courtesy call and have a close look at his naughty fingers that have been doing all the trashy writing, shall we? Antonio Tanaburenisau (born 1948) is a former Fijian politician. He won the Namosi Fijian Communal constituency as a candidate of the Fijian Association Party (FAP) in the general election of 1999. On 22 April 2005, Tanaburenisau pleaded guilty to charges of having taken an illegal oath of office as a member of the rebel Taukei Cabinet of George Speight on 20 May 2000, while the Fiji coup of 2000 was at its height. He had been present in the Parliamentary complex armed gunmen led by Speight had forced their way into the complex. He had ignored directions from his party leader, Ratu Tu'uakitau Cokanauto, to leave the building, and instead had participated in discussions that led to the formation of the Taukei Cabinet the next day, with himself as Minister for the Environment. At a second court appearance on 23 May 2005, he apologized to the coup victims, his constituency, and the nation. On 16 August, Justice Anthony Gates handed Tanaburenisau a two-year prison sentence, suspended on condition of continued good behaviour. Gates said that Tanaburenisau's role had been a relatively minor one, that he had gotten "carried away" and had acted without thinking of the consequences to himself or to his fellow-citizens. Gates said that he had taken Tanaburenisau's age into account, along with the fact that he had pleaded guilty, apologised, and expressed genuine remorse for his actions. Tanaburenisau thanked the court for the suspended sentence, saying that his offence warranted a custodial sentence. He said that he was deeply sorry that his own errors of judgement had caused so much pain. Anon 8.48pm March 16th. There will be no general election 2014 because you are part of the controlling system today. On the other hand whether you will be still around to witness come general election 2014. Only those soldiers will obey and do exactly what you said above are the one in your killing team of 50 or 100. Listen my friend, stop saying army or soldiers in general because they are not fools like you and your killing team. They know the rules of engagement and when killing people are justifiable. What you have been doing at QEB Killing Field is out of the written warfare rules. You murderer bastards. Listen, we are sniffing your scents on your foot prints you left behind everyday and soon we will reach you then take you killers down one by one. "At the tip of the foresight to the centre of the U , breath in - out - hold your breath - squeez the trigger" Boom!!! Do not forget that ONLY 50-100 soldiers under your command are causing this shameful killing and torturing at QEB Killing Field that also brought down the wonderful RFMF's reputation set up by our fathers and grandfathers to zero. You created this violence at QEB Killing Field, to armless men and women, to extract information with guns in your hands, heavyboots thundering and kicking at your feet, with unlimited uncensored UNKIND swearing words from your big mouth. ISA! SA SEGA DINA SARA GA NA LOLOMA MAI VEI KEMUDOUN NA SOTIA DAULABA OQO. Because of you and your 50 - 100 soldiers killing team may certainly may causing through illicit ways and means for RPG, M16, AK47 and other new weapons to take you on - guns vs guns, guts vs guts, hates vs hates. Do not forget that majority out there on the international waters hate you too that could pay and smuggle those weaponaries to Fiji. All because of you and your killing team of 50 - 100 soldiers. VEI KEMUDOU NA SOTIA DAULABA OQO NA MADUA KEI NA BULA NI VEIWEKANI KEI NA LOTU VEI JISU SA YALI DINA SARA GA MAI VEILKEMUDOU. Please STOP STOP STOP right now when there is still time for you to make friends by apologising to those you hurt. UK and the US are trying to create a "No Fly Zone" over Libya in an attempt to weaken Gaddafi by Taking out his Air power. This has been difficult and borderline impossible. WHY? Because China and Russia are on the UN Security Council. With the atrocities in Libya, Uganda, and many other Dictatorial regimes, Fiji may be only beginning to register on the radar of "threat to Civil Society" as a faint blip. There are more high priority nations out there. This is why this regime cozied up to these two countries so quick. The only solution is to help oneself, and then others will be able to lend a helping hand. @ fingered - that number belongs to Sekove Tulele, not jake? all u guys are good at are: commenting and threatening.....levu ga na vosa...sa publish tu qori na yacadra...sa bau dua e dare...me laki cakava e dua na ka.......nope....as i've said...levu ga na comment e na blog site qo...tamata lamu sona tiko....my fone no is 350 7771 im also an informer...i live at 211 Navosai rd, Narere...au kerea me dua mada lako yani i vale...as i've said ....please come...kevaka o lamu.....then keep your cowardly bloggy mouth SHUT...SA DRI YANI.. While we are on the topic of UN has anyone noticed that China and Russia never support any resolution that makes protecting human rights freedom of speech and protecting all that is good in the world. This has been so since i have been able to read basically. Makes you wonder what these 2 countries eventual agenda is. Why would they not act to protect human life and allow for freedom to prevail? The UN's no fly zone resolution has just been passed and as usual the 2 countries did note vote. It’s no wonder that the dictators of this world quickly jump into bed with these 2 countries as soon as they take power. Birds of a feather i guess. The civilized world should stop trading with these countries. But then again the western world’s love of good things cheap will probably never allow this to happen. China loves countries where one strongman, greedy, usually black and stupid dictator runs the country. It makes it easier for them to make there one sided deals which usually benefit them more then the host country. Less people to bribe. Give them a few millions let them have a few virgins and you got them by the balls. Sometime I wonder what the world would be like if America was not what it is today. Despite all its faults its is still a country that stands by all that is right and just in this world. America is criticized a lot but can anyone imagine a world dominated by China and Russia. I hope never to see that day. Jake Tulele, tobo tu o magaitinana! Max, what is your real name? @Paula Raqeukai: Apimeleki Digitaki is on the list because he was last year named in the interrogation of the former politician Peceli Rinakama. The former member of Parliament being abducted by soldiers from a house in Suva (Coupfourpointfive March 5, 25 and 31). We managed to obtain Rinakama's disclosure sheets and they revealed Digitaki and another officer, Kalusi Seri, interrogated him over several days. 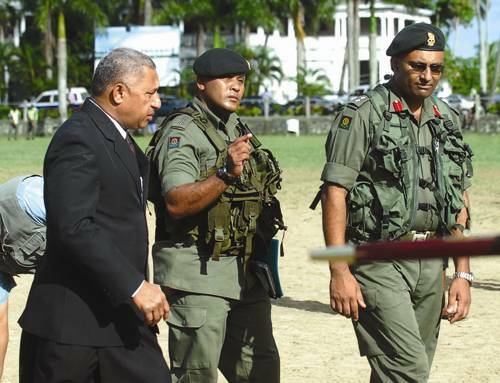 Rinakama was taken into custody after military soldiers overheard him making emotive comments, following the sentencing of his cousin and the high chief of Naitisiri, Ratu Inoke Takiveikata, to seven years for plotting to kill interim prime minister, Frank Bainimarama. Other officials from the SDL Party, including the director Peceli Kinuvuwai, were also arrested. Coupfourtpointfive obtained the disclosure sheets for Rinakama, which revealed the police spent most of the five days grilling Rinakama about his political affiliations, starting with his involvement in the Fijian Association Party, before moving to the Matanitu Vanua Party, which later amalgamated with Laisenia Qarase's SDL Party. The ethos that has been inculcated to the green goons is to always valataka na "DINA, DODONU kei na SAVASAVA". The fact that SOME of these torturers have been exposed is just that - "na Dina, na DODONU kei na SAVASAVA"!!!! Thank you C4.5 for exposing these bunch of scumbags and to you scumbags, watch every step you take, watch over your homes and families 24/7 - we will come and get you , now that we know who you are, your homes etc etc. We will do unto you what you have done to others - and worse. We will do you up, we will do your wife up, we will do your children up, we will shake you to your very core, we will leave you scarred for therest of your life, like you have done to us!! Max-waraka ga,namaka tiko.O na qai sikovi ga yani. Keimami na sotia keimami dau cakacaka ga e na bogi,keimami sega ni dau tukuna rawa na gauna keimami na lako yani kina oti qai vakamatavulo tale tu me keimami kua ni kilai.....moce Jo. Se vavei Peni kei Siwa neimami ring leader????? Max, I'll call by for a few bilos and then I'll smash your ugly face, like what the army goons did. Vinaka vakalevu Max, o kemunu e dua a tagane.. E vakaraitaki ni o keda na i taukei e sivia ga veikeda na vosa. O mai via vakarough-rough tu ena blog. please excuse my ignorance...but, how is publishing these details going to make any difference? I mean, off-cos the immediate families will be intimidated because the "man of the house" has been exposed. But then WHAT. Should we go "pot" their house with toilet paper? How is that going to make things any better! How is that going to stop them?? mobile line:+2348134250804. please no dirty games.